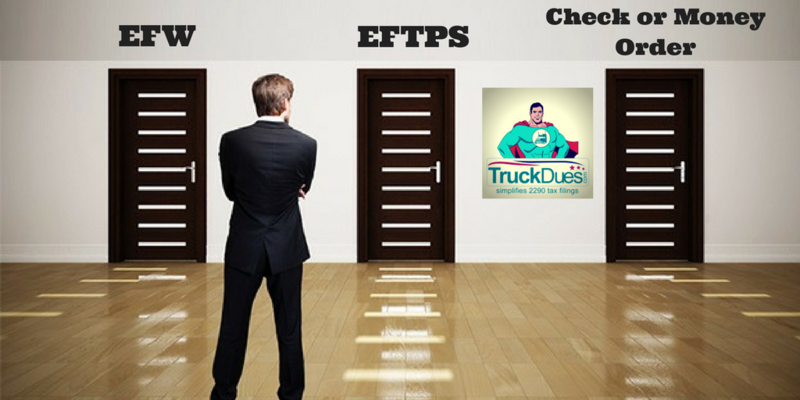 When it comes to E-Filing your IRS Form 2290 through an authorized E-File provider such as Truckdues.com, there are 3 different payment options. Taxpayers can pay by Electronic Funds Withdrawal, EFTPS, Check, or Money Order. The options to pay by check or money order may be easier to understand, but the options for Electronic Funds Withdrawal and EFTPS may need an additional explanation. If you elect to pay by Electronic Funds Withdrawal, you can use either a checking or savings account. You will need to enter the U.S. Bank Account Number and Routing Number in order for the IRS to Process the payment. This information is typically listed on a check. Electronic Federal Tax Payment System commonly referred to be EFTPS, It is a government program that allows you to schedule Federal Tax Payments electronically. If you select to pay by this option, you are acknowledging that it is your responsibility to send the tax payment to the IRS through the https://www.eftps.gov/eftps/ website. Form 2290 is generally due by June and it is payable until the end of August. This law is only applicable for Annual Renewals. Else, Form 2290 must be filed on a vehicle by the last day of the month following the months of its first use. Hence, we got a near-term HVUT deadline by the end of this month for vehicles that are into service since February 2018. Failure to file & pay your HVUT before deadline might result in a IRS notice demanding explanation and a penalty payment with proliferated interest rate applicable based on the late time past due date.